This LFB Championship play-off game will be one that will not be remembered for long as neither side played to their maximum potential. The game went into overtime and Céline Dumerc scored what turned out to be the winner with less than 5 seconds remaining in overtime for Bourges Basket to beat Lattes Montpellier (58-56) to take 1-0 in the best of three final. There were no fireworks during the first quarter of this match as defence was the order of the day. Belind Snell opened her account with the first points of the match within the first minute. Katie Manic scored Montpellier's first points of the game after almost two minutes of play to level the tie (2-2). Endeme Miyem got Bourges going and Snell obliged with a shot from her favourite distance behind the three-pointer line as Bourges took an early command of the game (9-2) with five minuets on the game clock. Then Montpellier finally got out of their starting blocks and took the games to their hosts. However they were unable to make any in roads to their deficit and trailed (12-18) by the end of the first quarter. Sandra Dijon (left) started to battle with the big women from Bourges in the paint and showed her touch from the land of many to tie the game (19-19). 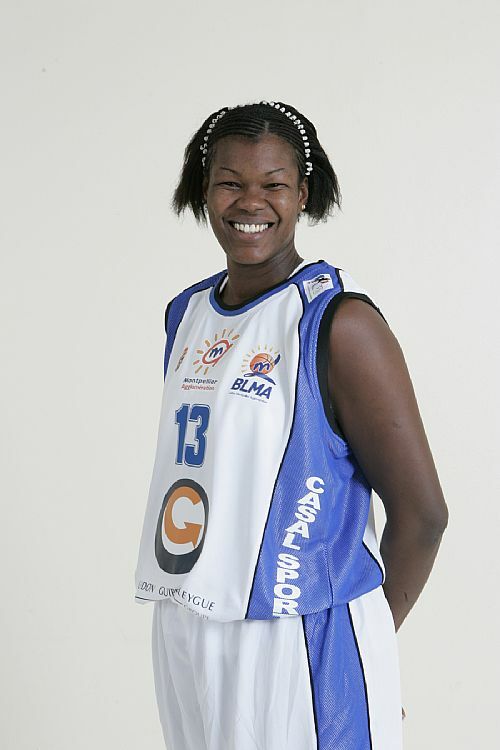 The battle between Emméline Ndongue (below) and Dijon was the story of the second period as they finished with 11 and 8 points respectively by the interval with Montpellier leading (29-28). Montpellier continued to win the battle of the boards during the third period and increased their advantage (35-31) with three minutes left in the third period. Snell, already on four personal fouls, was not available to make her customary shots from beyond. 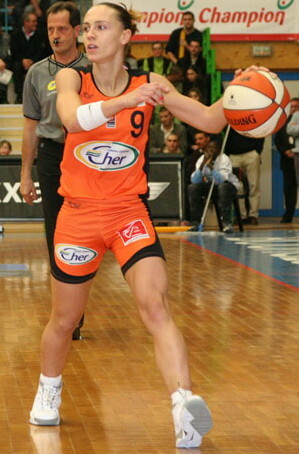 Hence the task was left to Céline Dumerc who hit a three-pointer to bring the teams level at the end of this quarter (37-37). Aurélie Bonnan set the hall on fire as she hit 9 straight points to give Montpellier (48-41) a nice cushion with just five minutes to go in regulation time. 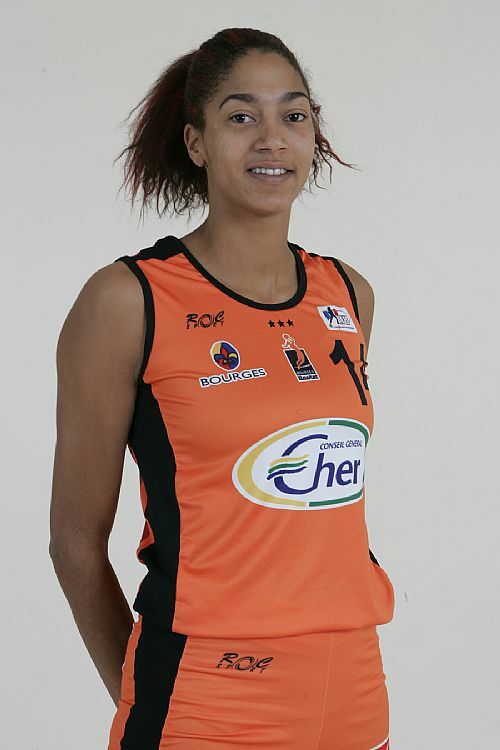 With Snell eventually picking up her fifth foul and having to leave the game, it appeared that Montpellier would hang on to take the first match. Dumerc and Ndongue had other ideas and quickly reduced their team's deficit to a single point. Cathy Melain levelled the score from the charity stripes. Dijon was to pick up foul number 5 and Dumerc had the chance to put the game out of reach of their hosts from the charity line but missed both shots. Bonnan then sent the game into overtime (49-49). Bourges were quicker to compose themselves and led for the first three minutes in the fifth period (54-52). Gunta Basko levelled the scores again (54-54) for Montpellier. The game was now in the last 30 seconds, Melain hit what she thought was the winner, only for Elodie Bertal to equalise with less than 5 seconds left. However it was Dumerc was to have the last word in this game by scoring the winning basket. Game two will be played on Saturday, 10 May.